Is there anything quite as lovely as a well-crafted marble countertop? With its classic luxury, marble has long been the go-to choice for counters. There are many benefits to choosing marble for your kitchen, its beautiful, durable, versatile, and it doesn’t require too much maintenance. 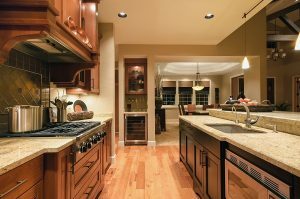 No matter what material you choose for your counters, you’ll need to follow maintenance and care rules to ensure that they look great for years to come; marble counters are no different. Part of what makes marble counters so unique is that they develop a patina over time. While this may not be for everyone, it’s possible to prevent it to some extent. No matter what material you choose for your counters, you’ll need to follow maintenance and care rules to ensure that they look great for years to come; marble counters are no different. When choosing a marble option for your counters talk to the fabricator to discuss which type of sealant you will be using with your counters. Over time you will know when it is time to re-seal by whether or not water creates a bead when dropped on the counter. Resealing your marble is a simple process that is easy to do on your own as long as you have the correct materials; your fabricator should always give you a list of recommended products to use. Some elements can cause etching and discoloration to occur much faster than it otherwise would. Acidic foods and liquids, in particular, can have a detrimental effect. Foods like tomatoes, citrus, and pineapple as well as vinegar can cause the effects of etching to happen prematurely. This can be prevented by always wiping and cleaning spills as soon as they occur and by always using a cutting board, especially when dealing with acidic items. Cleaning your marble counters is often easier than other surfaces, but care must still be taken. You will want to avoid any abrasive cleaners or anything that is too acidic. Sweeping off any large crumbs and then washing with simple soap and a soft sponge should work for most things. For tougher messes, a tile and stone cleaner is the safest option. Marble is a porous stone so it can be prone to stains if anything is left sitting on it for too long. Removing stains is not complicated though, you will simply make a poultice paste to spread on the stain and leave to dry for 12 to 24 hours. If the stain is very deep-set, you may need to repeat this process. This entry was posted on Friday, January 18th, 2019 at 11:34 am. Both comments and pings are currently closed.